In 1986, Checks Unlimited was founded, becoming one of the first major mail-order check printing services. Back then, the company operated under the moniker "Current Checks". Their catalog of check designs was quite limited in the beginning. The company has certainly expanded since then. Just counting designs that are specifically for personal checks, they offer approximately 70. They also specialize in business checks as well. Checks Unlimited is currently based in Colorado Springs. In addition to their line of both business and personal checks, they offer a range of accessories that those who use checks will definitely find handy. You can find their website at checksunlimited.com and you can make savings on your orders by using Checks Unlimited Coupons, a list of which we keep up to date at Coupofy. When it comes to writing checks and bank accounts, security is definitely a major concern. They take their consumer's security seriously as there are plenty of fraud protection tips on the website.Visitors can also find various fraud protection services on the website like their EZShield Plus package. This security feature will help ensure that you aren't stuck paying for purchases that you didn't authorize. It offers protection for up to $25,000.The website also makes clear how security-conscious their Securiguard checks are designed to be. They are printed on chemical protective paper, have holographic foil, and offer five more advanced security features.Website owners who come to the site can also sign up for the Checks Unlimited affiliate program. With a cookie that lasts for 120, you can earn 20% every time someone buys something after coming to the website through your link. Checks Unlimited is definitely the place to go to for your check purchasing needs. It doesn't matter if you're an individual or a representative of a business as they offer both personal and business checks, with many different designs to choose from that you won't find from standard bank printed checks. There are approximately 110 designs for both personal and business checks in their portfolio. These designs include cartoon characters and other notable icons. You also have the ability to use some personal photos in your design. The company knows that you'll eventually run out of checks and need to get more. Once you start using their services, you can utilize their easy reordering process for maximum convenience. You may also find their check accessories useful. They include address labels, address stampers, and checkbox covers.Another useful item for sale on the website is RFID wallets. With a typical wallet, nefarious people could use technology to steal the information on your credit cards. An RFID wallet will block this type of attack to keep your information safe. When ordering from the company, you'll only have one suitable payment method. You'll need to pay with a major credit card such as Visa, American Express, MasterCard, or Discover. To personalize your check order you must also provide valid US bank account information. If you're redeeming a Checks Unlimited coupon code there is a special promo box before payment where you can type or paste it in. Checks Unlimited offer a range of delivery options so you can get your order within the required timeframe. These include Standard Delivery, which takes up to 10 business days, Trackable Delivery, which takes between 4 and 6 business days, Guaranteed 2-Day, which takes 2 business days, and Overnight Delivery for 1 business day. Because checks have to be printed you must allow up to 5 business days for your order to be dispatched, which is on top of the delivery time. From time to time you can use a Checks Unlimited coupon code to get free shipping. 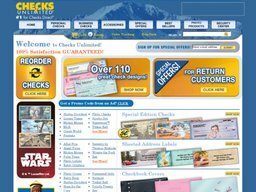 All orders from Checks Unlimited are backed by their 100% satisfaction guarantee. This means that you'll have no trouble getting a refund if something is not right about your checks.